1) American Gods series in the works? : I know many will wish my face to melt when I say this, but American Gods is way over rated. I liked it, don’t get me wrong. The level of adoration this book has doesn’t seem justified. Gaiman has much better stuff than this.I do admit it will make a great TV show or movie. 1) A horrible NewYorker article about George R.R. Martin and his horrible impatient scumbag fans: Legions of impatient Martin fans find happiness in ruining their favorite author’s day/life. 2) An articulate well reasoned response to the above article, written by a impatient scumbag fan: Well, the nerve of this fan. He’s a fan and he sounds so reasonable and…. and… nice? But what about the New Yorker article? I’m so confused. 3) Pern goes to Hollywood: This will be terrible. 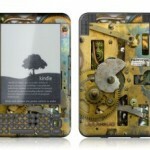 4) Win a Steam-punk Kindle from Angry Robot: OK they got me… this is pretty nifty.I’m looking forward to seeing the entries. 6) Jeff VanderMeer compiles a list of quality international Fantasy and Science Fiction: Jeff has compiled a nice list of his favorite international speculative fiction. No denying Gaiman is a great writer, but I just didn’t dig American Gods all that much either. What annoyed me about American Gods is that it had so much potential to be brilliant. Then it wasn’t. I didn’t get all the American Gods love either. He has much better books. Anansi Boys, which is in the same universe was a better read.